LG Electronics Inc. said Monday it has installed a large digital signage at the largest shopping mall in Delhi in the latest move to promote its organic light-emitting diode displays. 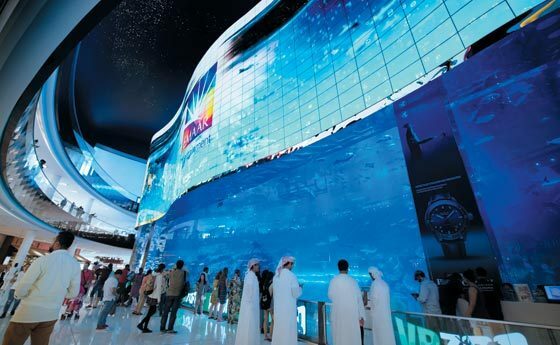 The new signage, built at Ambience Mall, located in the capital city, utilizes a whopping 63 units of 55-inch OLED display. Standing 8 meters tall, the signage are installed in a ring so that they can be observed at any angle, the company said. The displays will show off various advertisements, including those of LG Electronics' premium appliances, the LG Signature. The tech giant supplied OLED signage at another Ambience Mall, located in Gurgaon, near Delhi, last year. LG Electronics said its signage products based on OLED displays can be installed in various designs as they can be curved.